Nordstrom’s Black Friday Sale has started online! Save an extra 25% off already marked down items. 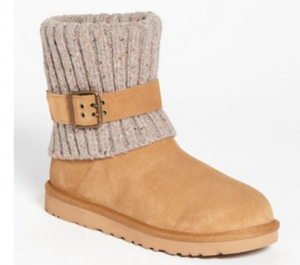 I spied some great deals on select UGG boots for kids and adults. Save from 15 – 55% off some of the most popular styles — a rare sale this close to winter! ‘Bailey Button’ Boot (Walker, Toddler, Little Kid & Big Kid) — $44.96, regularly $100 Sizes are limited and going fast! ‘Bailey Button’ Boot (Women) – $97.42, regularly $164.95. In chocolate or navy. ‘Cambridge’ Boot (Women) – $89.92, regularly $169.95. In chestnut or black. Check out all the Nordstrom’s Black Friday UGG deals HERE.